Autzen Stadium, home of the University of Oregon Ducks football team, is located north of the Willamette River from the UO campus, adjacent Alton Baker Park. Students walk from campus over the Autzen Footbridge and along a tree-lined path to attend games. On a beautiful fall day with full autumn color, this is a spectacular experience in itself. With plenty of space for tailgating and several sports bars in the vicinity, game day offers many celebratory options. This iconic outdoor stadium accommodates 54,000 roaring Duck fans, with sellout attendance well over the last decade. Even before the Ducks current national rankings, local fans were resolute in spirit and loyalty. Today, it is the largest sports arena in Oregon, and widely regarded as one of the loudest stadiums in collegiate sports. 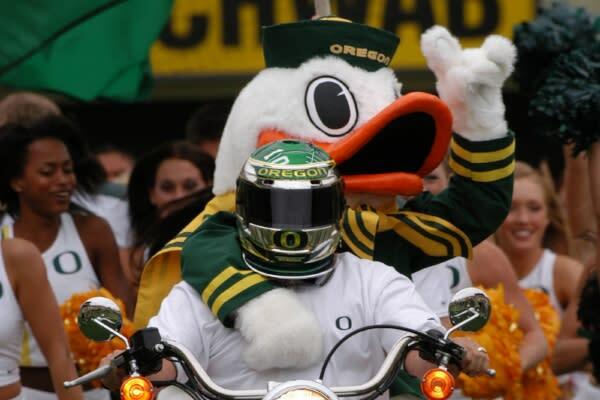 Traditions include the Oregon Duck mascot astride a motorcycle leading the players onto the field, the PA announcer declaring "it never rains in Autzen Stadium" no matter the weather, blaring a foghorn when the Ducks score, and playing the song "Shout" at the end of the third quarter - a tribute to the National Lampoon&apos;s "Animal House" which was filmed here in 1978. Besides movie set, Autzen Stadium has also served as a concert venue for the Grateful Dead and Bob Dylan. As UO football gained popularity it outgrew its original Hayward Field location and moved to Autzen Stadium in 1967. Since then, stadium upgrades have included the addition of meeting facilities, a new press box, several seating expansions, added luxury boxes, turf resurfacing, a new massive scoreboard and more. The surrounding sports complex also includes PK Park (baseball), Pape Field (soccer, lacrosse), the Moshofsky Center and the Casanova Center. The Hall of Champions and Hall of Fame trophy and plaque collection on the second floor of the Casanova Center is open for public viewing prior to home games. 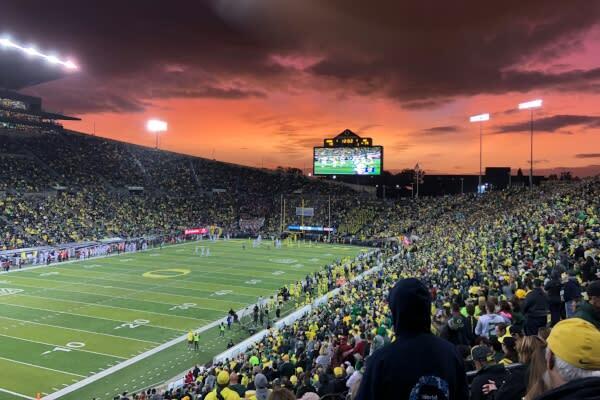 The largest and loudest outdoor sports arena in Oregon; the iconic Autzen Stadium seats 54,000. The Ducks play on FieldTurf, beneath a massive mega-screen dubbed "Duck Vision." The complex includes sky suites and boxes, a 10,000 sq. ft. club room, concessions, merchandise outlets, box office, guest services, bike corral and adjacent meeting and event space. Find pre-game entertainment in the Moshofsky Center. Shuttle service is also offered from eight Park & Ride locations across town. Mallard Park Hospitality Tents can accommodate up to 500 for private tailgating parties.